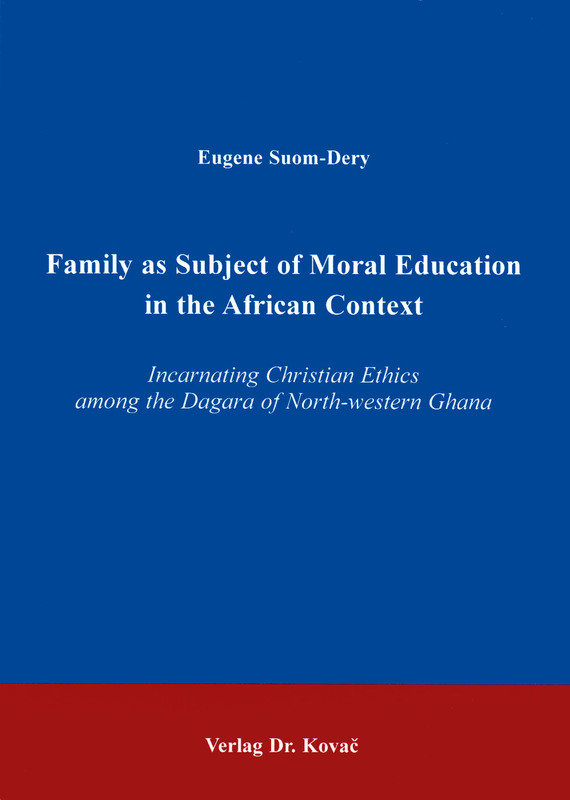 The Family as Subject of Moral Education in the African Context. Doktorarbeit von Eugene Suom-Dery, Verlag Dr. Kovač 2000, 562 S.
This book responds to these questions with an impressive investigation of significant features of African ethics and morality - e.g. African cosmology and ontology, the concept of person and conscience, the nature and moral educational significance of the family, the concept of moral value, human destiny etc. The author designs a plausible concept of incarnational moral education within the African Christian family based on the norm of Christ, the enduring African moral values and some relevant insights of the human sciences and moral pedagogy. Dr. Eugene Suom-Dery’s work is an important contribution to the current discussion of inculturation or incarnation of the Gospel message among African peoples in the area of moral theology. It concludes with an analysis of the subsidiary role of the Church in the State of Ghana with regard to the tasks of the family. The book is useful not only for readers who need information about African traditional religion, philosophy and ethics, but also for researchers of African Christian moral theology and inculturation.